Last week I decided to stop at Shark River Park in Neptune, NJ. Shark River Park was established in 1960. It’s actually the oldest Monmouth County Park. It’s just under 1000 acres and located between Neptune and Wall. There is plenty to do at Shark River Park including, fishing, hiking, and it even hosts cross country races. It has about 9 miles of trails. I had planned to just check it out and walk about a mile or 20 minutes. Even though I brought both a hard copy of a map and a trail app, I ended up getting lost and walking around 5 miles. Since it was my day off and I had nowhere to be, it wasn’t a big deal, but I was glad I brought water out of my car as well. Here are a few of the trails I covered. I didn’t use a Garmin, so I can’t tell you how much of each trail I covered. I do know I know I covered the entire Pine Hill trail since it was a loop. Ceder Loop Starts at the center of the loop. There is a “Fitness trail” which is flat and would be great for running. It has 20 stations with strength workouts. You know…workouts I always say I’ll do with running and don’t. The Hidden Creek trail is about 2 miles long and connects to the Pine Hills Trail. I only now I was on this one because I did cover Pine Hills! Finally, the Pine Hills Trail is close to the Garden State Parkway and goes up a few small inclines. It’s nothing unmanageable. I am definitely going to come back and run, and I bet it’s such a fun cross country course. Are there any good hikes near you? Recently I went to the Mays Landing Diner. I’ve found it more fun to ask Twitter to choose a diner based on a name. I have to go to all 500+ sometime right? Anyway, after an appointment down that way, I ended up at the Mays Landing Diner. I arrived for dinner, and it was dark. When looking, I had thought I had already been to the Mays Landing Diner. It looked so familiar. Then I realized it shared a lot of characteristics of the Galloway Diner. The exterior is big, clean, and shiny. It was well lit up for the holidays. The inside had plenty of booths, tables, and a full-length bar. It was everything you picture in a diner. The coffee was brewed fresh and hot every time. The waitress brought out plenty of refills, and she added a lot of whipped cream. The menu at Mays Landing Diner is extensive. They have everything you want and need in a diner. Like many diners down the shore, it’s heavier on seafood. I ordered the Philly cheesesteak and seafood bisque soup. The soup was interesting. I don’t know if I’ve ever had seafood bisque, so I wasn’t sure what to expect. It was a mix of Mariana and white sauce. There was imitation crab (I actually like that…as well as usual crab meat of course) and had a kick. In all, it was good. The Philly cheesesteak was decent. It wasn’t the best, or the worst. It was one of the biggest cheesesteaks I’ve had and was probably about a foot long. The waitress was one of the best I’ve had in a while. She refilled beverages often, came over to check on us, and my food came out within 10 minutes. For my coffee, cheesesteak, and soup the cost was $16. I liked the Mays Landing Diner and had a pleasant experience. I’ve wanted to go to the Windjammer for a while. My original plan was to go after the Atlantic City half. However, I had to work so there wasn’t enough time. I only had to wait two extra weeks and went after the Totally Awesome 80s Run. We arrived around 11 on a Saturday. I anticipated the Windjammer to be crowded. However, it wasn’t. I was pleasantly surprised because after any race I typically want to eat immediately. The Windjammer is a typical large restaurant building. However, there is nothing “diner” about it. It’s clean and open, but it is more of a restaurant than a diner. It’s open and well lit, but it’s a regular restaurant. It isn’t a classic metallic NJ, but it’s clean and well organized. The tables and booths are spread out, so you don’t feel as if you’re sitting on top of anyone. The coffee was delicious, and the waitress brought us plenty of refills. It was locally brewed Lacas brand which is one of my favorite roasts. The waitress was one of the most friendly and attentive I’ve had. She refilled the coffee, brought us everything we needed and was just an overall nice and friendly person. You can tell the Windjammer has a lot of regulars, and she made everyone feel good. I overheard her say “Wow you look great today” and “See you tomorrow.” It almost felt like we were the only nonregulars! The Windjammer is open all day and breakfast, lunch and dinner. It has a much smaller menu than most traditional diners. Since the Windjammer is on the shore, they specialize in seafood and burgers. They have a lot of different crab options too. I was hungry, so we ordered the hummus appetizer. It came with roasted carrots, zucchini and squash as well as hummus and pita. Pita bread is one of my favorite types and this was one of my favorite appetizers to date. I could have ordered 2 for my meal and been perfectly fine. For my entree, I was craving a burger. I ordered their burger which came with French fries. 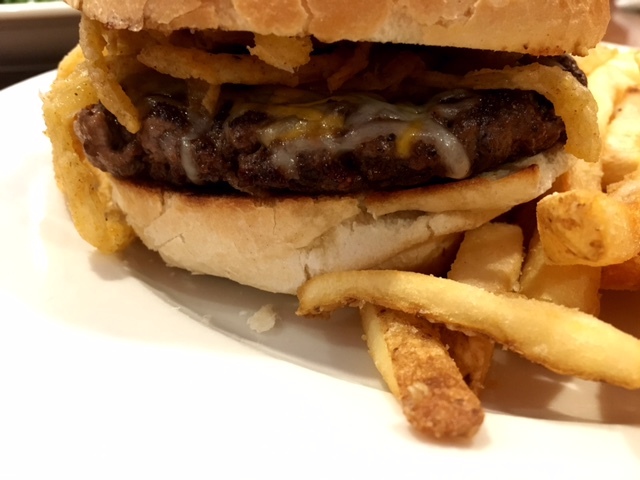 It was topped with onion rings. It was juicy and cooked just how I like it, medium. The burger was cooked just as I asked and the bun was toasted. It appeared to be a homemade roll too, and you can never go wrong with that. The French fries were toasted and crunchy. For my coffee, the appetizer, and burger the cost was $18. The quality of food made that worth it. The quality of food, as well as quantity, made the Windjammer one of my favorite diners. The service was excellent, and I have no complaints. Do you like pita bread? What do you crave after a hard workout?